One of the most in demand trends in interior home finishing's is the Shaker door profile.With its simplistic style and clean lines the Primed 4 Lite Shaker French Door compliments multiple interior design themes.Satin White glass filters light while maintaining privacy making it a multipurpose door that can be used for any room throughout the home.Milette Doors are proudly made in Canada with over 50 years of manufacturing expertise.We use only premium quality North American wood harvested from sustainable resources. 30-inch x 80-inch Primed 4 Lite Shaker French Door with Satin White Privacy Glass One of the most in demand trends in interior home finishing's is the Shaker door profile.With its simplistic style and clean lines the Primed 4 Lite Shaker French Door compliments multiple interior design themes.Satin White glass filters light while maintaining privacy making it a multipurpose door that can be used for any room throughout the home.Milette Doors are proudly made in Canada with over 50 years of manufacturing expertise.We use only premium quality North American wood harvested from sustainable resources. 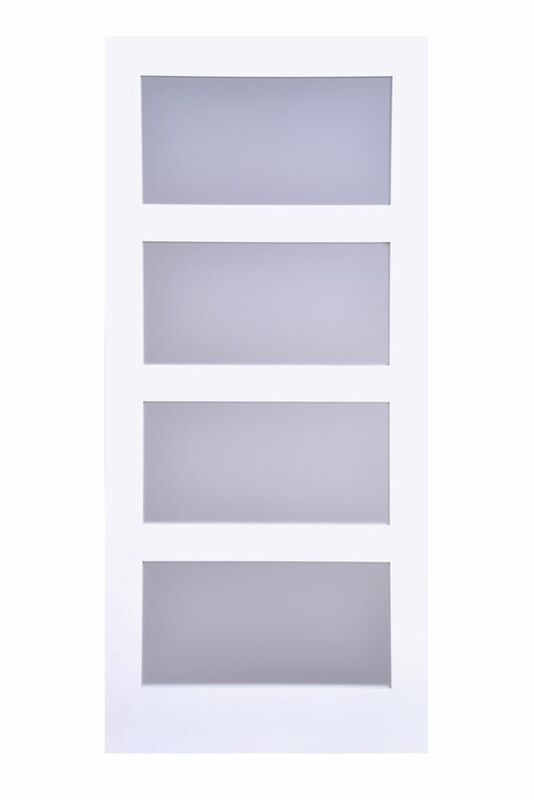 30-inch x 80-inch Primed 4 Lite Shaker French Door with Satin White Privacy Glass is rated 2.6 out of 5 by 5. Rated 5 out of 5 by Shelly from Looks fantastic! I also had the "flaws" in the glass on my door but I the instructions on the door that said the glass should be cleaned with a Mr.Clean Magic eraser and it completely solved the problem! Love the door, very happy with my purchase - looks fantastic! Rated 1 out of 5 by timmber3 from So disappointed. Ok this is a typical door anyone can install, however when all said and done and you stand there and appreciate your hard work and start peel the protective plastic you realize the manufacture cheaped out horribly by spraying the primer over the plastic glass protector. Thus when peeling off the plastic cover your in for a horrible of a mess, this dry paint primer will stick to your feet, your skin, the floor. Peeling the plastic off was suppose to be the finishing touch, this just added another hour with the vacuum and sandpaper to remove off the floor. STAY AWAY! Rated 1 out of 5 by Dave from Flaws in the Glass Like an other reviewer mentioned - when the protective plastic is removed from the glass most of the panels have noticeable flaws where the frosted film(?) or treatment that is used to frost the glass is visible in terms of streaks, thinner areas, uneven sections, almost like it hasn't been applied properly. It seems to be more common around the edges of the glass. If I could do it again, I'd look at getting a door with textured glass rather than a frosted film. Definitely would not recommend this product. Rated 5 out of 5 by Bobby from Perfect The quality is great. I would highly recommend this to anyone. It needs 2 coats of paint to look perfect!! I purchased 5 of these doors and one has a stain from the glue under the protective film that apprars on about 60% of the glass on 3 panels.I have tried several mild cleaning solutions but no luck.Only one door had this problem. What is the fix? Can I buy the hardware and use it as a barn door to separate the laundry room from the bathroom? Yes this door can be used as a barn door.